Well first one I need to say thank you to all doctor and Modern Cancer Hospital Guangzhou. My name ’s Thith Visot come from Cambodia and I live in the city center. It’s the first time that I and my wife came to China. for staying and curing the liver cancer in Modern Cancer Hospital Guangzhou. I feel exited, and so happy with doctor and nurse. All so staffs who can take care and look after my wife and every patient here very well without singing about difference people and country. Fortunetly we arrived this hospital .It’s meant that we can live in the world more long time or our live happen again ,and now my wife operation finished successful and have a good condition. 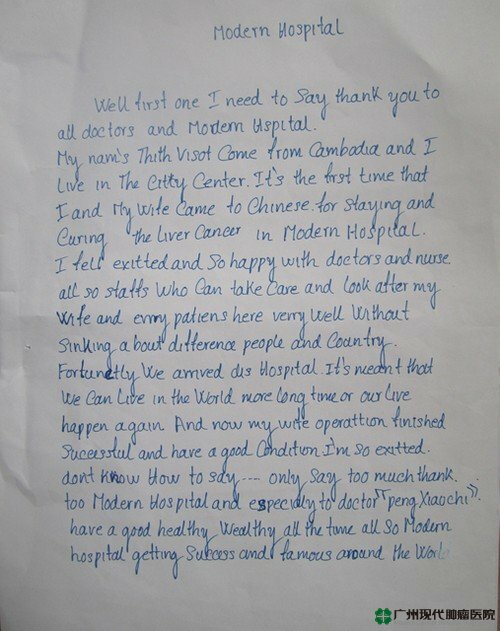 I’m so exited, don’t know how to say……only say too much thank to Modern Cancer Hospital Guangzhou especially to doctor “Peng Xiaochi”,have a good healthy wealthy all the time all so Modern Cancer Hospital Guangzhou getting success and famous around the world.